Our customer from the retail industry was running their business at multiple retail outlets with a standalone POS System which also managed the inventory and accounting data. The main reason why they came to us, was because the current system was not providing them a decision making support. They were searching for a comprehensive management solution that can solve this problem and provide powerful analytics which will improve the decision making process. With the increasing competition in their region, it was very difficult to find out why the sales have dropped. The customer was on the verge of losing market share. The implementation of VIENNA Advantage Solution took around 4 weeks. The complete master data and stock was imported. The product master data fields were customized. The specific reporting requirements were analyzed and the reports such as dashboard reports and tabular reports were driven. After the implementation the sales were directly recorded in the VIENNA Advantage POS terminal which was linked to material management and accounting. Apart from that the POS drives information from the product attributes management and customer management. All ordered materials are recorded in a form of a purchase orders and are compared with the material receipts to see any discrepancies. Open POs can be tracked, and the vendors can be intimated in case of any change to the existing orders required during the season. An intelligent aging system gives early alerts on items which are moving below average so that the stock correction options with the vendors can be utilized, even before the payments to the vendors are due. Before the end of the season sale, most of the non-moving items can be pushed towards the customers at lower discount averages than they would have been pushed during the end of the season sales. It is possible to track the average purchasing and average sales price of each item so that an exact profit statement can be driven from the system. Number of items sold and cost comparisons give a good way to negotiate with existing vendors and analyze the purchasing strategies. A customer loyalty program is launched by the retailer. The discounts which were given in terms of monetary discounts to the customers are now turned into discounts on further purchases on non-moving items or very profitable categories so that the sale of items as well as the customer loyalty has increased. 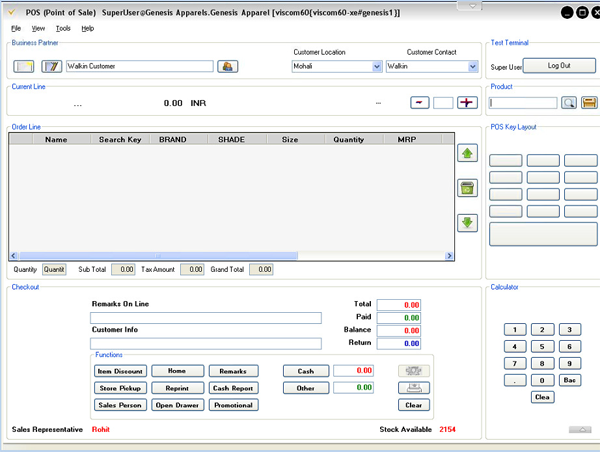 The performance of each sales person can be tracked with one click and the commission can be generated from the system. Motivational programs, to push the sale, were introduced by the store management. The store operations are now concentrated on more objectivity and information based decisions so that the top management is more relaxed. Find and download Case Studies from other industries here. How to Evaluate a CRM – Customer Relationship Management Software?